"When You Wish Upon a TV..."
After discussing that first issue of (Superboy and the-less) Legion of Super-Heroes, I decided it would be fun to take a look at the other series that spun out of the split. The New Adventures of Superboy features a young Clark Kent as he balances his entry into adolescence with his amazing super powers. Now... if you were to ask me to descibe Superboy in one (hypenated) word, it would be "Kon-El". I never really paid much mind to the stories of "Superman when he was a boy"... I just wrote them off as too silly, or too confusing when I try to reconcile them with my staunchly post-Crisis POV. With all that said, I wanna take a look at a random issue from the volume... and try to do so with "new" eyes. I snagged this one mostly due to its cover... specifically the bottom right corner of the cover. Superbaby? Really now... that's either going to be the best thing ever... or the worst. Let's find out together, shall we? It's a beautiful Saturday morning in Smallville, and two of the towns most prominent citizens are enjoying it in very different ways. Superboy decides to fly around the world "just for the fun of it", while Lex Luthor is busy puttering away in his recently rebuilt lab on a weapon designed to take down the boy of steel. As Lex continues to work he frantically recounts how Superboy has affected his life... cost him his original lab as well as his hair. All the while his magne-coil powered device is reaching critical mass... Luthor narrowly escapes his lab before it explodes! In the distance, Superboy sees the resultant plume of electrified smoke from where Luthor's lab once was. He heads over to check it out, and is able to contain it... but not before getting a decent-sized ZAP. Not thinking too much of it, Superboy goes about his civilian business. Luthor pulls himself out of a lead-lined bunker and is disappointed that Superboy got away with but a zap. A week goes by, and we pop in on Clark and Lana as they leave the soda shop. Soon as they hit the sidewalk, a woman's purse gets pinched... I never realized Smallville had muggers! Lana looks to Clark like "Are you gonna do anything about this?"... and ultimately gives chase herself! Clark raises his hand as if to stop her... and finds that the mugger is almost magnetically drawn into his invulnerable appendage. Police Chief Parker just happened to witness the entire event... and posits that Superboy must have been flying overhead, and used his super breath to knock the thief down and out. If it's good enough for him... it's good enough for me! Later, Clark in his Superboy togs heads over to the Smallville Carnival where he witnesses one of the rides going kaput. It's a spinning jet car ride... and the cables have snapped! 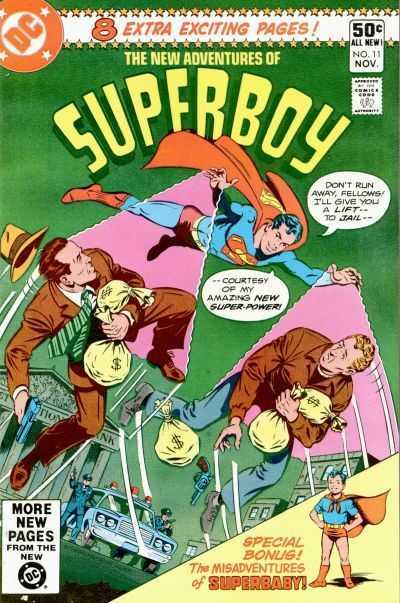 Superboy uses his new bio-magnetic powers to safely halt the jets before they crash into the fairgrounds below. The news of Superboy's new powers is out! At the Kent home, Clark is demonstrating his new powers to his parents by serving breakfast... while sitting at the dining room table! The Kents urge Clark to try and get to the bottom of these new powers... which takes him to the remains of the Luthor Lab. Luckily for Superboy, he finds all the information he needs on some scattered sheets of paper at the lab ruins. Lex himself is present as well... they share a contentious exchange, and after Superboy leaves, we get the impression that everything is (somehow) going according to plan for young Mr. Luthor. That night, Superboy is studiously reading up on his new powers. Ma pops her head in to check on him... and the towel she was holding gets yanked into Clark's room. Suddenly, everything in the house appears to be getting magnetically drawn to Clark! He bursts out the window before doing any real damage to his home or family... and as he flies over the farm several trees uproot and magnetically attach to him. He flies overhead just as Lex Luthor is exiting a movie theater... or maybe he's just loitering... either way, he smiles knowing his "doom plan" is proceeding according to plan! Superboy leaves Earth orbit, and begins attracting satellites. In the distance, he spies a black hole... and decides that perhaps the only way he can shake this curse of a power. Without much of a thought... he hops in! Once inside the vortex, he realizes that he just may have played right into Lex's hands here... This whole thing is something of a Rube Goldberg plot, and the Boy of Steel fell for it hook, line, and sinker. Superboy decides that if instead of fighting the pull of the black hole vortex he just goes along with it... he just might make it through. As such, he goes limp... and wouldn't you know it... he makes it out okay! It's a rainy day in Smallville, and Martha Kent plops her infant son in front of the television set to occupy him until their guests arrive. On the TV is Aladdin and the Wonderful Lamp. Moments later, the first guests arrive. It's baby-Lana Lang and her parents. Lana is sent into the TV room, and her father claims to be bearing gifts... or at least he thought he was. Ya see, he planned to give them a "magical" stone idol... but he forgot it. Or did he? After wishing he had remembered it... he reaches into the pocket where he would have put it... and finds it there! A little later yet, the next guests arrive. It's the Farmers... complete with their baby son, Willy. He's crying a blue streak because it's raining outside and he can't go out and play. In between tantrums... the little brat wishes the rain would stop, and even starts to sing. Wouldn'tcha know it... the rain (rain) went away (but, curiously only in the back yard). In the living room, the Kents are entertaining. Martha laments that she hadn't prepared enough sandwiches... and (get this) wishes she had. She opens the fridge only to find it full of (peanut butter and baloney) sandwiches! The adults all freak out, and begin blaming the magical idol for the events of the day. They all line up and beg the statuette to return them to Smallville... but, it seems they left out the magic word. Superbaby tells Pa that they need to wish if they want it to come true... and the elder Kent now knows something's up. It turns out Superbaby was doing his own rendition of Aladdin and the Wonderful Lamp on this day... and, while playing "genie" was behind all of the odd occurrences. Instead of Jonathan telling his son to cut the crap and bring them home, he decides to indulge him one more time. The inhabitants of the Kent house all gather around the "magical" idol like goofballs and wish to return to Smallville... and so, they return. As a parting shot, Pa Kent accidentally-on-purpose knocks the magical idol off the end table... destroying it. What a fun silly issue! Now, this would've been the kind of thing that would have me running for the (relative) safety of my X-Men issues as a kid... but, now... I really enjoyed it. Perhaps I'm softening in my mid-thirties. Superboy (much less SuperBABY) was something I'd shied away from in my youth... thinking it to be silly and inconsequential. Hearing the John Byrne criticism of "Superboy stories" never really being in doubt really emboldened my stance as I entered adulthood. I suppose I wrote them off for all the wrong reasons, as this was a joy to read! Is it vital? Nope. Does it matter? Nah. Is this even in continuity anymore? I haven't the foggiest idea... and it doesn't really matter, I guess. All I know is that I had fun reading it... and fun writing about it. I think sometimes I get caught up worrying about "what matters" in comics. Continuity is my drug of choice, don't get me wrong... but, I think there's room for stories like this. I often forget that there's a whole world of silly DC stories that happened before the Crisis on Infinite Earths... stories I really ought to start exposing myself to, because... I really feel as though I missed out! It's fun to think there were still pseudo-Silver Age stories being told into the 1980's. I think at the end of the day, Comics Oughta be Fun (now where have I heard that before?)... and this here is a fun comic! Superboy was never my jam... but I can really see myself getting into it. Heck, this may actually facilitate my getting into the Legion of Super-Heroes in a way. I'm glad I read this, and look forward to checking out more. Both stories were a blast! Definitely recommended for an almost anachronistic good time! Never knew the Rich fortune was built on GRIT!